Mental health conditions are not uncommon. In fact, did you know that one in five Americans have a diagnosis of a mental health condition? In the case of Bipolar Disorder, 60 million worldwide are affected by the diagnosis according to the World Health Organization. The good news is that help is now more available than ever to identify and diagnose Bipolar Disorder. However, as someone who used to suffer with this condition, there are some things that doctors might not always tell you. If you have received a diagnosis or believe you might have Bipolar Disorder, formerly called manic depression, you probably know that getting a diagnosis is not a straightforward process. There is no blood test, for example, that definitively tells you that you have the illness. Mental health professionals use the DSM-V (Diagnostic and Statistical Manual) and take a survey of your symptoms and ask you how it impacts your life and relationships and use that checklist to determine which type of Bipolar you may have. The Depression and Bipolar Support Alliance reports that 7 out of 10 people are misdiagnosed at least once and that the average length of time from first experiencing symptoms and diagnosis is a decade. Every person is unique and your illness may not look exactly like it does for someone else. It can also change over time, becoming more or less severe. No matter how much you surf the Internet to learn more about Bipolar Disorder, the most common definitions you’ll find is that the disorder is characterized by alternating periods of energetic euphoria with boundless energy followed by episodes of debilitating depression and lethargy. In real life, these episodes might not always present like a textbook. They could be mixed episodes, which means they could occur all at once, feeling wired and depressed at the same time. Other types are not as severe or have periods of remission of symptoms. If you think of Bipolar moods like a rollercoaster track, some hills might be very steep and others less so. The defining aspect is how the mood episodes alternate and disrupt your life. Treatment often begins with a regimen of medication. Your psychiatrist might not tell you that they are using trial and error to see which combination of medications will work best for you. While you wait for the medication to build up in your system, you`re told to “be patient” and give the drugs time to take effect. However, the dosage may need to be changed, another drug may be needed, or the side effects may be too severe to live with. So if it doesn`t work, you have to switch medications and start the process again. The side effects of these drugs can be extreme, from muscle spasms, fatigue, weight gain, stomach issues, and in many cases, a worsening of the mood swings themselves. There Is Another Choice – Neurofeedback Training. Drugs act on the body`s chemistry in an attempt to control the symptoms of bipolar disorder. The source of the problem, improper brainwave balances, is not addressed at all. Neurofeedback training is different in that it goes to the source of the mood swings, and helps correct brainwave functions in the brain itself. Once the brainwaves are more balanced, the symptoms can disappear on their own. There are many studies show that neurofeedback can be an effective treatment for Bipolar Disorder and other mood disorders like depression, anxiety, and PTSD. First, we analyze the brainwave balance using a brain map, or qEEG. First done in 1924, EEGs have been around a long time. As a result of this, we have a good idea of what a calm, efficient, brain map looks like, and also what one looks like if the person is suffering with anxiety or depression. With this information in hand, a custom training protocol can be developed to help correct the imbalances using neurofeedback training. If you`re like I was before I tried neurofeedback, you will find the training to be a pleasant, relaxing way to improve your brain function – permanently! Unlike medications, the training process actually creates new neural pathways in the brain, which remain in place long after the last training session has occurred. The training sessions themselves are 30 minutes long, during which you will be relaxed, watching a movie or video of your own choosing. While you watch the show, we will be monitoring your brainwave output, comparing it to the protocol goals set using your very own brain map. If you get anxious, the movie goes dim, causing your brain to re-focus on the screen, calming the anxious thoughts in the process. Over time, your brain trains itself to stop having those anxious thoughts, even when you`re not in the office! If you are struggling with the Bipolar emotional rollercoaster and are looking for a better way, call us today at 703-335-9149 to set up your own no-risk, no obligation evaluation with me at my office in Manassas, Virginia. I know what you’re going through because I’ve personally been there. Let me help you find the same long-term relief I have, so you can get your life back. 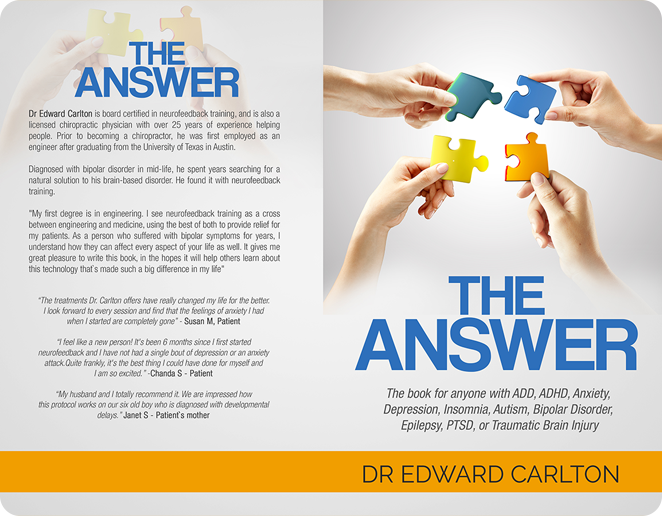 Download my eBook and learn more about how neurofeedback works.